The Welcome to Palestine Mission Delegates announced their upcoming demonstrations in front of the Israeli and French embassies in Amman, the capital of Jordan next Thursday (30-08-2012). The organizers emphasized that the protest will firstly address the Israel system of apartheid, and secondly to refuse complicity. 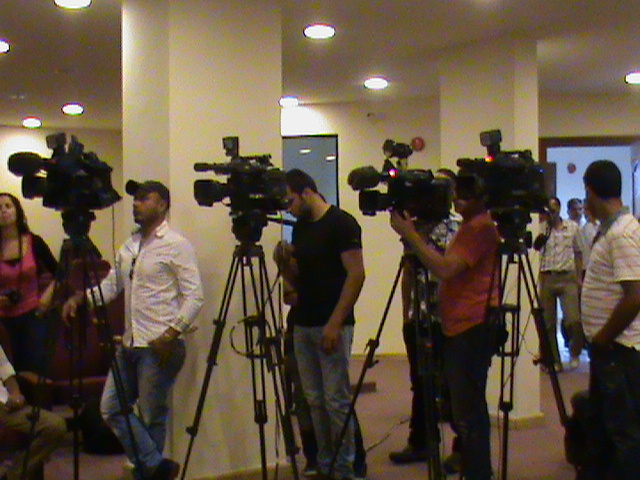 In a press conference, held in the Union of Journalists in the presence of good number of media agencies (see below, in particular, the report of AFP) was also an opportunity to reaffirm that the international friends of the Palestinians have not given up to break the blockade which encloses an entire people. The Welcome to Palestine Mission stated that “New initiatives, before the end of 2012, will be launched”. We denounced the shameful and complicit position of the French Government, which has not showed any interest in applying its simple principles of freedom of movement towards and inside the occupied West Bank. Even though the French government claimed to defend this principle, it did not raise any protest against the denial of 100 Welcome to Palestine participants who traveled on last Sunday at the King Hussein/Allenby Bridge, to reach Bethlehem where we were denied entry into the West Bank by the Israeli army. The activists talked about their first visit to the Palestinian refugee camps in Amman. The Welcome to Palestine volunteers visited Baqa’a, Jerash and Wahdat refugee camps where they spent last night and complete their visit today. International activists were amazed by how Palestinian refugees are attached to their right of return to Palestine. The palestinian refugee encounter precarious situation regarding citizenship issues as, for many for them, have no nationality or freedom of expression. It is even prohibited to show a Palestinian flag. For many of Welcome to Palestine mission, these Palestinian refugees are the first Palestinians to meet since Israel denied them entry the occupied territories. Local and international journalists showed their interested to join the international activists on Wednesday morning to the camp of Jerash. The volunteers will officially deliver the scholastic supplies to schoolchildren of the refugee camp, where the majority of this refugee camp are originally from the Gaza Strip. Finally Michael, one of the Welcome to Palestine mission activists, underlined the ashamed decision of a court of Haifa on Tuesday morning, which dismissed the Israeli army and the Israeli government of any responsibility of Rachel Corrie’s death, American ISM activist who was crushed by an Israeli military bulldozer in Rafah on March 16th, 2003. «This remarkable symbol of a complete impunity which lets Israel murders and massacres» he commented. European and American pro-Palestine activists announced on Thursday their will to try again to enter the Occupied Palestinian Territories, in order to provide aid to children, after having been barred from doing so by Israel and Jordan. “We believe that, most certainly in December, we will have another mission, more important, to break the siege of Palestine”, Olivia Zemor, a spokesperson for operation “Welcome to Palestine” said while speaking to the press. “We have not decided yet whether the destination for the next mission will be Gaza or not”, she added. On Sunday, Israeli and Jordanian authorities had denied the one hundred delegates strong mission of “Welcome to Palestine” to enter the West Bank, through the Allenby Bridge which links Jordan to occupied West Bank, where they intended to deliver stationary and other school items. The Jordanians had initially let a first bus drive towards the Israeli check-point on the other side of the River Jordan, where the activists were denied entry and their vehicle was ordered to make a U-turn back, while the second bus was not even to leave the Jordanian side, the activists stressed. “The Jordanian authorities should absolutely consider that the Israeli government is not a respectable one with which one can collaborate as long as Israel does not abide by the international laws” Mrs Zémor said. It is recalled that the Hebrew State and the Hachemite Kingdom have signed a peace treaty in 1994. “If there is a siege, and there is one, if the Palestinians are arrested, jailed, tortured, murdered, bombed and dispossessed, it is because there is a collaboration between our our governments and Israel”, according to Mrs Zemor, chairwoman of CAPJPO-EuroPalestine, a French NGO advocating the end of Israeli occupation of the Palestinian Territories. The activists, from France, Belgium, Spain, Switzerland, and the United States of America, will donate the aid they had brought for the West Bank to children of the Palestinian refugee camp of Jerash, north of Amman. They have also planned to demonstrate on Thursday in front of the embassies of Israel and France in Amman. “We want to say the Israeli rulers that they are occupiers and terrorists who exert terror against the Palestinians and all those who dare supporting the Palestinian people. We also want to show the French government how much we are dismayed for not having even protested or expressed its disagreement after what Israel did”, Mrs Zemor explained.